BALTIMORE, December 16, 2015 — This holiday season, Oyster Recovery Partnership (ORP) and Pride of Baltimore II have partnered to create limited-edition Pride II oyster knives, with proceeds supporting ORP’s large-scale oyster restoration efforts in the Chesapeake Bay. The project was conceptualized as a way to raise awareness for Oyster Recovery Partnership and Pride II, two nonprofits working to preserve the past and support the future of the Chesapeake Bay. The knives are crafted from the tropical hardwood that was used to build Pride II, one of the best-known U.S. sailing vessels in the world. Given the historic nature and limited supply of the wood, the Pride II oyster knives are being made in an extremely small quantity. The knives can be ordered through the Oyster Recovery Partnership’s website, and orders placed by Friday, December 18 will ship in time for the holiday season. Click here for complete details. A clump of three-year-old hatchery seed oysters found in Harris Creek on Maryland’s eastern shore. 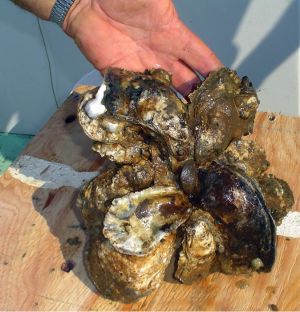 While it may look innocuous, an oyster is vital to life in the Chesapeake Bay. Oysters create a habitat for a multitude of marine life including the Blue Crab and Striped Bass. But oyster populations became threatened by overharvesting and pollution in the 20th century and were nearly decimated. Now, after a century of decline, the oyster is making a comeback. The oyster’s resurgence is due in large part to the efforts of nonprofits such as the Oyster Recovery Partnership (ORP), Maryland’s leading nonprofit restoring oysters in the Bay. Commissioned in 1994, with the help of their partners ORP has planted nearly 5.9 billion oysters on 2,200 acres of oyster reefs. Seventy thousand bushels of shell have been recycled to provide homes for new oysters. A healthy, adult oyster can filter silt, sediment and excess nutrients from as much as 50 gallons of water a day. ORP also operates the Shell Recycling Alliance, which is the country’s largest network of restaurants dedicated to recycling oyster shells. This Alliance enables the public, restaurants and caterers to save oysters from going into landfills. Restaurants across the state, District of Columbia and Virginia participate in this innovative shell recycling program: For a complete list of participating members, click here. Select restaurants, such as Woodberry Kitchen in Baltimore and the Boatyard in Annapolis are featuring the Pride II oyster knives and even offering shucking demonstrations. Proceeds from the Pride II oyster knife project will support the Oyster Recovery Partnership (ORP)’s large-scale projects in the Chesapeake Bay. For every dollar raised, ORP will be able to plant approximately 100 baby oysters into the Bay, making a direct impact on oyster restoration efforts. “Simply put, oyster knives are a symbol of the Chesapeake Bay culture we are striving to preserve, protect and grow,” Abel says. The Pride II oyster knife design is a classic, American model known for being sturdy, versatile and dependable. The teardrop-shaped knife handle is carved from timbers of bullet wood and mahogany used in creating the keel, or structural beam, of Pride of Baltimore II. The wood has been preserved in climate-controlled conditions since Pride II was completed in 1988. Each knife has a 3-inch, stainless steel blade laser-engraved with the names Pride II and ORP. A keepsake certificate of authenticity and matching number from 001 to 500 accompanies each knife. For nearly four decades, Pride of Baltimore and Pride of Baltimore II have represented the people of Baltimore in ports throughout the world, spreading a positive message of Baltimore and extending the hand of friendship globally. Since her commissioning in 1988, Pride II has traveled more than 250,000 nautical miles and visited 40 countries in 200 ports. Pride II has become one of the best-known U.S. sailing vessels in the world, capturing the imagination of millions of people.